500ml bottle. Best before end: 28.08.11. I have seen adds for this all over the U-Bahn in Muenchen, so I decided to give it a try. It pours a fizzy yellow gold with a foamy white head that dissipates immediately. Huge carbonation bubbles cling to the glass walls. It isn't a pretty looking dortmunder. The look is reconciled a bit by the smell, it smells lightly fruity with a sweet grain overtone and just a kiss of hops. The flavor also isn't bad. Again it has some fruity almost alcohoic notes, a noticeable sweetness, and a slight bitterness. It is a simple, rustic beer, but it is hindered by its awkward appearance, but all in all if your gonna drink this one form the bottle it isn't bad. Light golden. Quite clean, very few rising bubbles, a decent white head. Not inviting smell at all: old hops, cooked grains. In the taste there aren't the same defects, but it is still an useless beer. Malty notes, no more. Flat, in carbonation and in taste. It slips away without any trace. Useless. BB 24-2-06, Good presentation with lasting snowwhite head and cristal clear pele golden collored beer. Nose is extremely malty, very clean and minimal fruity citrussy like hopnose making this one fresh and inviting to drink. Taste also malted to the max, still overall dry carcter, clean, litle alcoholic and overal fresh and highly beery to me. Good and quiet high carbonisation makes mouthfeel evenfresher and one of those fine bavarian brews I could drink all night. Poured from a 0.5l bottle into a 0.5l branded Paulaner weizen glass. Appearance: Yellow and translucent. Fizzy head dissipates almost instantly. Not impressed. Smell: Grassy, with hoppy notes. Nothing special but nothing great either. Taste: Kind of thin with barely any taste. Grassy and hoppy aftertaste. Not too great. Mouthfeel: Really thin with a watery taste. Too heavily carbonated as well. Drinkability: Not impressed. 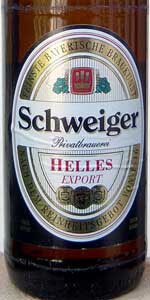 There are much better Helles beers out there. Poured from half-liter bottle into nonic pint glass. Appearance: Pours a blonde color with a pretty small head that leaves behind a little lace. Some bubbles rising from the bottom of the glass. Not too impressed with the looks of this. Smell: Weak smell. Slightly metallic with slight floral notes, also some grassiness and a bit of malt character come through. Taste: Starts with a fruity sweetness, finishes with a pretty strong, almost nutty bitterness. Well balanced flavor and much better than the smell would let on. Mouthfeel: Pretty thin, but has a balanced carbonation character. Drinkability: Not an outstanding beer, but pretty good nonetheless.It's somewhat refreshing and the balance of the flavor makes it pretty tasty, although it lacks in other areas. Wouldn't mind having it again, but among German beers there are so many better choices. Pours light straw clear beer with white as bride gown head, nice retention. Smell - clear malty, somewhat papery. Taste - clear malty, metallic notes, bitter background. Some sulphur, but is okay.